Clemson researchers are taking common materials to uncommon places by transforming easily obtainable and affordable materials into fiber. Their findings are published in Nature Photonics, the world's top journal focused on light-based technologies. "We have used a highly purified version of beach sand (silica) for fiber for the last 40 years," said John Ballato, director of the Center for Optical Materials Science and Engineering Technologies at Clemson University. 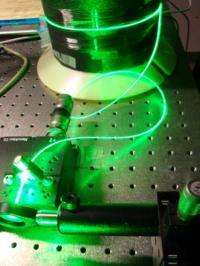 "As a matter of fact, the 2009 Nobel Prize in Physics was awarded for the development of silica optical fibers. However, while silica has done remarkably well over time, it is now being pushed to its limits for faster and cheaper data and new functionality." It has gotten to the point where there is so much light packed in fiber cable that the silica material essentially can't handle the intensity and has actually begun interacting and rebelling. "At high power, the light causes the atoms of the material to vibrate more violently and those vibrations convert some of the light energy into sound energy which restricts the ability of the fiber to carry more power," said Ballato. "This, in turn, lessens the amount of light that can travel through the fiber, which limits the amount of information that can be sent for telecommunications uses and power for high-energy laser applications,"
The demand for stronger and more durable fiber material is greater than ever and will only increase with technological advancement. Clemson researchers are focusing on providing a material solution for fiber optics, especially one that can be sold commercially. Their goal is to take a robust, affordable, and easily accessible material that can take the brunt of greater intensity and convert that material into a fiber. Ballato and his team found that sapphire possesses extraordinary properties that make it exceptionally valuable for high power lasers in which the light intensity interacts with sound waves in the glass and leads to diminished power-handling capabilities. "Sapphire is new and different in this sense because we're able to use a low-cost and widely used commodity as a fiber," said Ballato. "Sapphire is scalable, acceptable and is a material that people don't think about when it comes to fiber optics. The problem is that sapphire's crystalline structure is not amenable to making into optical fiber using commercially accepted methods." Ballato actually developed the sapphire fiber to withstand greater intensity and be more useful for high-energy applications than typical commercial fibers. "Ballato's recent results with sapphire fibers represent a paradigm-shifting development in the field of fiber optics," said Siddarth Ramachandran, associate professor in the electrical and computer engineering at Boston University and an expert in the field. "Materials long considered to be used only in the realm of free-space optics can now be exploited in fiber geometries, which enable long interaction lengths and novel nonlinear optical effects." "This research is paving the way for everyday commodities to be imagined for technological uses such as fiber optics," Ballato said. "We're performing additional studies with sapphire and other materials that have similar effects for fiber." The article could have included some basic info on sapphire. Per Wikipedia: it's aluminum oxide (Al2O3), transparent from UV to IR, 5 times stronger than ordinary glass, and much tougher than tempered glass. It's used with composites for shatter resistant windows in armored vehicles and various military body armor suits. Some xenon arc lamps use sapphire windows to tolerate higher thermal loads and thus higher output powers.